Employers can get the credit without a SHOP plan -- in Washington state and parts of Wisconsin. A few U.S. counties might have a slightly easier time using the federal health insurance tax credit next year. The Internal Revenue Service has temporarily eased the qualification rules for the tax credit – but only for employers in five counties in Wisconsin and 37 of the 39 counties in Washington state. The IRS will let small employers in those counties use the tax credit in 2014 without offering a health plan from a public health insurance exchange, according to IRS Notice 2014-6. Carriers in the affected counties won’t be offering any small-group exchange plans in 2014, officials say. Section 1421 of the Patient Protection and Affordable Care Act created the tax credit by adding Section 45R to the Internal Revenue Code. Before 2014, any small employer with modestly paid employees could use the tax credit. 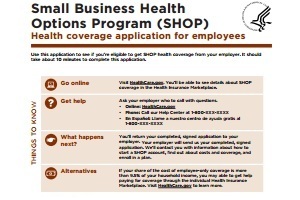 Once the Small Business Health Options Program exchange plans open, employers are supposed to use the credit to pay for SHOP exchange plan coverage.